Children's parties have never been better. Our goal is for the party to be the one your child always remembers from their childhood, while being stress free for mom and dad. If you bring the food, we will do the rest! Each of our centers is designed to be a creative and cool place that you will enjoy being in. Parents are welcome to stay and will be able to see the activities, and they are often intrigued, without needing to be in the room itself. Often parents have the opportunity to enjoy a cup of coffee and catch up with each other as the kids are captivated by our experiments. We will take care of you and the kids as every party will have 3-4 staff members helping with the experiments, food, celebration, and guiding you through the party start to finish. The party will last 90 minutes, which includes close to an hour of hands-on science. We use two separate rooms for the parties - one for the experiments and one for the food, to facilitate a great party. 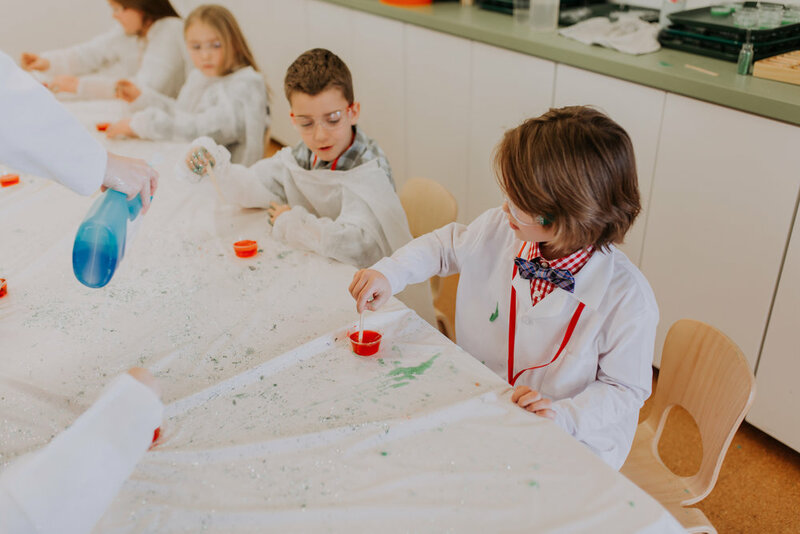 In the science room, a party includes 5-7 hands on activities for each of the children attending. We then move to the food room where we will eat, celebrate, and have time for cake. All led by our team so you can relax. Every party includes a number of hands-on science activities for each child to do themselves (not just demos). These activities range from making polymers to experimenting with pressure (safely), your kids will have fun and learn too. We have experiments with slime, cool chemical reactions, and many more (all of our experiments are safe). Kids love our parties because they get to experience something new and see the impact of their experiments in real time. Here is the good news, almost nothing. If you bring the food, we will provide the tablecloths, plates, wall art - with a happy birthday, all the experiments, our exceptional staff (3-4 people) to deliver 5 star customer service, and care. We only ask the food you bring is nut free.